As I mentioned before on this blog, I had hundreds – if not thousands – of requests for all sort of things during my 4 and a half years as Ayrton Senna’s Press Officer. The trickiest involved Nelson Piquet and it is posted under Senna. The funniest of them involves George Goad and Eric Silberman. Who??? Exactly, that’s the funny part. I’ll comeback to them. As most people in the business are aware, every big name in sports or entertainment has somebody (sometimes even a machine or stamp) who ‘helps’ them with the autographing business. Ayrton was not different. In those days, he really signed himself every single one of the requests I presented to him. And many, many more. However, there were still a good amount of posters, post cards and merchandising items which required his signature before going to the VIP area or to sponsors events. At his McLaren: this autograph is the real thing! Well, those were signed by Eric Silberman, at the time Press Officer for Honda. Eric is a man of many talents, polyglot, good writer and his sharpened sense of humour used to keep us inn good spirits after long hours in a circuit. And to top it all, Eric was left handed as Ayrton. I was convinced , and still am, that it helped in the way the letters tilted in the same way to the same side. 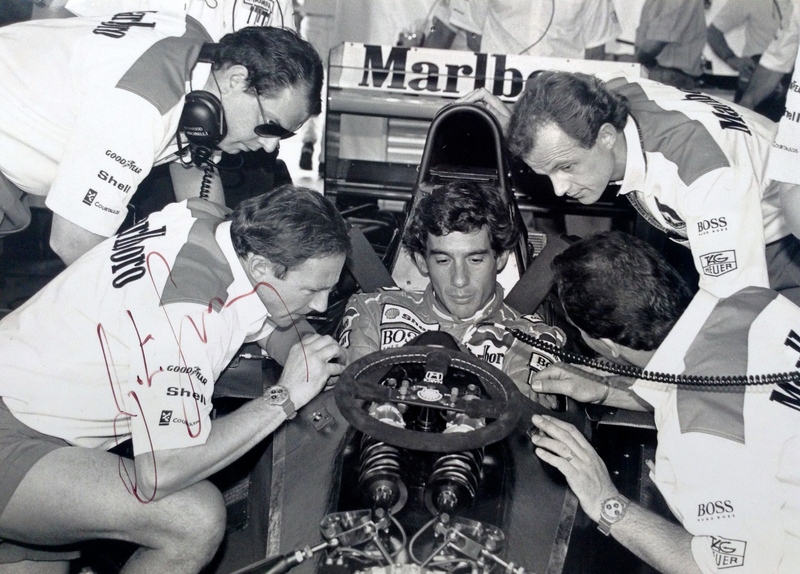 Later on, being the jokes that he is George decided that the only Senna’s autograph that he wanted was a fake one on Eric’s photograph. Well, and guess who was put in charge to break news to Ayrton? “Hi there, do you think you could fake Eric’s signature in this photo”, no , there wasn’t the right way. Anyway, I eventually found the right way and time to tell Ayrton that Erica was autographing things for him for the team and that’s why, there was this lanky American journalist sitting at the table in the motorhome expecting to have his autograph in a photo of Eric. Unlikely as it seems, Ayrton understood the joke and went along with it. A funny story. I have two of Ayrton’s autographs – both from McLaren. I sent 2 photos to them on separate occasions (1990 & 1991) and was fortunate enough to get them back; signed. I’d like to think that they were both genuine however, this post makes me wonder! Oops!! I have no way of knowing it. i can assure you Senna signed a ridiculous amount of autographs and, if it ended up on my hands, he did yours, too. Thanks for the reply Betise. I’m as confident as I can be that they’re genuine! The first one came back with a dedication and, over the years, I’ve seen copies of the many documents that Ayrton wrote (aside from his signature) and his ‘individual writing style’ seems identical to one of my photos. The second, and most treasured is a photo I sent to McLaren, just prior to Imola 1991. I seem to remember that I’d read that he was to visit the factory in Woking for a seat fitting (possibly) and I took a chance and sent it in. It was returned by Peter ‘S’ (who you probably remember from TAG McLaren Marketing, who worked closely with Ayrton), signed by Ayrton. I’m eternally grateful to both Peter (and Ayrton!) to this day. I still have both and will never, ever part with either of them. I think times have changed today and this is not possible any more. Your post was a great story though. I appreciate that the demand for autographs were (and still are) absolutely huge for the highest profile people and that they do sometimes need….a little ‘assistance’! Now that I’m a lot older (!) I tend to share your view about the purpose of autographs in general. On reflection, what is priceless to me NOW are not the autographs themselves but the fact is that I can say, with pride that “I actually saw Senna race several times- live – and saw him win”. I realise that there are many fans in Sao Paulo that will have never had that privilege and remembering this makes me feel very lucky indeed. Hi Geoff. I can remember Ayrton signing lots of flags through his career, not specifically in Australia 93. But if the signature is not very similar it is probably Ayrton’s as the guy who signed for him some time was very good!! And 93 was a pretty emotional race as his last one for McLaren. So signature might have suffer a bit, too. Hi Betise: Would you be in a position to authenticate an autograph? Would you have any samples of Aryton’s English writing in 1993? Thankyou so much for your help so far. Hi Geoff, I don’t think I can authenticate Ayrton’s signature as such. I certainly know what it looked like and can say with some authority when a signature is NOT his. But I’m afraid, as I wrote here there was a guy who copied it to perfection! There weren’t many and he only did at my request so if you know the place and time you got yours I can try and work it ou the probability. Probably. Don’t remember ever asking the other guy to sign anything in silver. Hi Betise: This Aryton flag of mine is a bit of a tricky one. Is there any chance of you being able to email me a genuine handwritten autograph or even some handwriting of Aryton’s so that I can see if what I have could be the same? I only have one autograph from him. And not sure it’ll be very legible. But I’m sue you can find a specimen at the Senna Institute site or in the internet somewhere. I’m really enjoying reading your various Ayrton Senna articles and just wondered if I could send you a photo of a signed 1990 Autocourse book that I have in my possession signed by Gerhard and Ayrton. The original owner won a competition to be a VIP guest of Honda at the 1990 British GP and amongst all the papers I have thanking both Honda for the wonderful experience and his pass documentation, both teammates signed the inside page in bold black felt tip, would it be possible for you to just see the signatures and in your opinion whether you think Ayrton actually signed this? Thanks for coming back to me so quickly Betise and for your reply, it’s much appreciated. I hope you have a wonderful Christmas and a prosperous 2016! I recently acquired a 1990 British Grand Prix Autocourse Annual book signed by both Ayrton and Gerhard. The original owner of the book was a competition winner with the ‘Autocar and Motor magazine’ here in the UK and the prize was a VIP guest of Honda at the 1990 British GP. The pack includes correspondence between the Mr Whyte (the competition winner) and Honda where he thanks the Honda representative for the memorable day and the signed book. There is also correspondence between Mr Whyte and the Autocar magazine where again he thanks them for the day. Also there is the original Honda hospitality itinerary for the day, a couple of photos showing Berger and Jonathan Palmer, the original race program, race day ticket and a Honda booklet with stickers. So it is quite comprehensive and I’m delighted with it. I was just wondering if I could send you a photo of the signatures just to get your opinion on whether you feel you might be genuine?